The site Fudzilla has reported that Intel's future Arrendale CPU line should also have a Turbo mode on their integrated GPUs. Quick recap: Arrendale is a Core i7 with a GPU included in the CPU package, like the Core i3/Clarkdale. These processors will be available from the first quarter of 2010. The most advanced version in this release cycle will be called the Core i7 620M, clocked at 2.66GHz for the CPU and 500MHz for the GPU. This processor has a quoted TDP of 35W. It appears that when Turbo mode is enabled, the Core i7 will be boosted to 3.33GHz, but the GPU will also be boosted to 766MHz. This should provide a significant increase in overall and especially gaming performance. The slowest Clarkdale (32nm) processor is the Core i3 530. It will run at 2.93GHz, with 4MB cache and will support DDR3 at 1066 or 1333MHz. It will have a TDP of 73W, and will have an integrated Intel GMA GPU which will be capable of decoding HD video. The Core i5 differs from the Pentium G9650 due to it's support for HyperThreading. In this picture we can see a Penryn CPU package on the left, with a Clarkdale CPU package on the right. As you can see, the GPU will not be in the same die as the CPU cores. 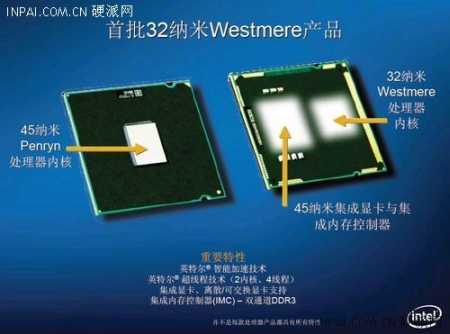 Initially, the GPU will be a 45nm chip stuffed next to the 32nm CPU die. This packaging type is reminiscent of the Pentium II Xeon, which had the same dual-die design, with seperate dies for its CPU core and onboard cache. Hopefully, this architecture will not pose too much of a problem for heat dissipation, thereby making it easier to overclock. Intel have said that they will no longer produce plastic LGA protectors for all their new processors. The LGA protector is a small piece of black plastic which is clipped over the LGA contacts on the CPU. It is intended to protect the contacts during transportation, but is usually immediately thrown away by the consumer. It is a sign of quality but certainly not very eco-friendly. Therefore, Intel is likely to review the design of its packaging to ensure the contacts do not touch anything during transportation. eVGA announces a motherboard supporting 4-way SLI with 7 PCIe 16x ports! 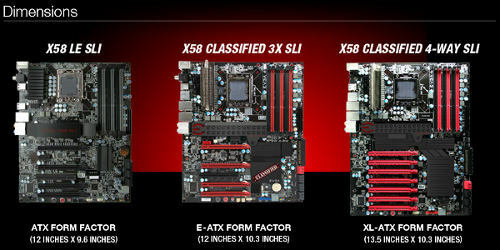 eVGA is offering a new motherboard: the X58 Classified 4-way SLI. It's very simple: x58, 7 (for single slot) 16x PCI-e ports, all compatible with 4-way SLI, or 4 (double slot) cards for folding! The regulars will retort that only 3 dual-slot cards can be installed in a normal case, not 4. This board also introduces a new form factor: XL-ATX. This is E-ATX with an extra 1.5 inches of space at the bottom of the board for the fourth card. 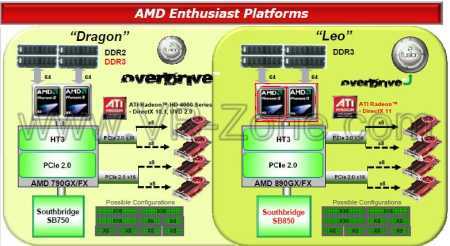 AMD has previewed the transition from its Dragon platform to the new Leo platform in April 2010. The new platform should feature AM3 processors manufactured on a 45nm process which will be released next year, with the AMD FX/GX890 northbridges and SB850 southbridge. The Leo platform will incorporate new DirectX 11 graphics cards, namely Helmlock and Cypress (Radeon HD5800). The new chipset will also support important new features such as improved CrossFire performance, support for AMD's Stream and the platform-agnostic OpenCL, and facilities for overclocking with AMD Overdrive and Fusion II. It will also have special memory profiles for Black Edition processors. The motherboards in this platform will support SATA3 (6GBps) and USB3.0 and will feature Broadcom networking. According to the first benchmark leaks, the new Radeon 5800 GPU might be 60% faster than the previous generation. The new ATI GPU which is expected to be released on September, integrating DirectX 11 compatibility, is expected to deliver 2 TFLOPS. This power can be increased by about 80% by adding a second board. The main advantage of the AMD chip over the GT300 from nVidia might be in a lower power consumption and a more reasonable thermal dissipation. This information comes from 3D benchmarks, so we can't predict the final speed in GPGPU applications. However, Folding@Home GPU2 clients should perform much better on this new hardware ! Two new processors recently surfaced in Japan. The first is the Celeron E3200, a highly clocked dual core, perfect for feeding the GPU at lower costs as the price is 4850 yen (42€, £32, US$52). It is clocked at 2.4GHz, with an 800MHz FSB, 2MB of L2 cache and VT-x (Intel's virtualisation technology) support, and a TDP of 65W. Its arrival was expected in the third quarter of this year, but Intel appear to have gotten ahead of themselves as it is not mentioned on their site yet. Like the E3200, the quad-core Q9505 is invisible on the Intel site. This is actually a Q9550 with half the cache (6MB rather than 12MB). The other specifications remain the same: 1333MHz FSB, a frequency of 2.83GHz, manufactured on a 45nm process with a 95W TDP. The price of this processor is 22800 yen (about 200€, £150, US$245). AMD will soon launch a new Phenom II X3: the 740. This processor is clocked at 3 GHz and has 512 KB of L2 cache per core along with 6 MB of L3 cache shared amongst the 3 cores. It uses the Heka (tri-core) architecture, which is a Deneb quad-core die with one core disabled (will it be possible to reactivate some series' spare cores ?). We do not know the exact price or release date though we know it is expected in the third quarter of 2009. However, we can get an idea of its eventual price range with the X3 720 clocked at 2.8 GHz which is sold for about 90€ in mainland Europe, £90 in the UK and $120 in the United States. 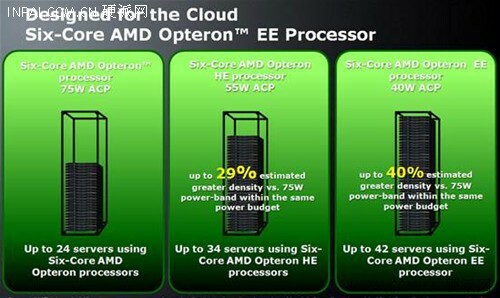 AMD launched today its Opteron 2419 EE (Energy Efficient) processor designed for servers with two processors. The Opteron EE has an average power consumption (ACP) of only 40W. The 2419 EE is manufactured on a 45nm process and uses Socket F (Socket 1207). It runs at 1.8GHz, with 6MB of L3 cache and a Vcore of 1.125V. This processor has six cores (using the Istanbul architecture), with AMD-V (virtualization) and AMD-P (power management) technologies. It will cost US$989. AMD's intended applications for this processor are in cloud computing, web servers and high-density computing environments. There are now 11 models in the Istanbul lineup: this EE 40W, two 105W SE models, five 75W standard models, and three 55W HE models. This processor is a step towards energy saving in the server room, but its price may put it out of reach of many users.